Set foot in one of our cabins and the first thing you'll notice is that tasteful weathered-wood exteriors give way to inviting interiors. 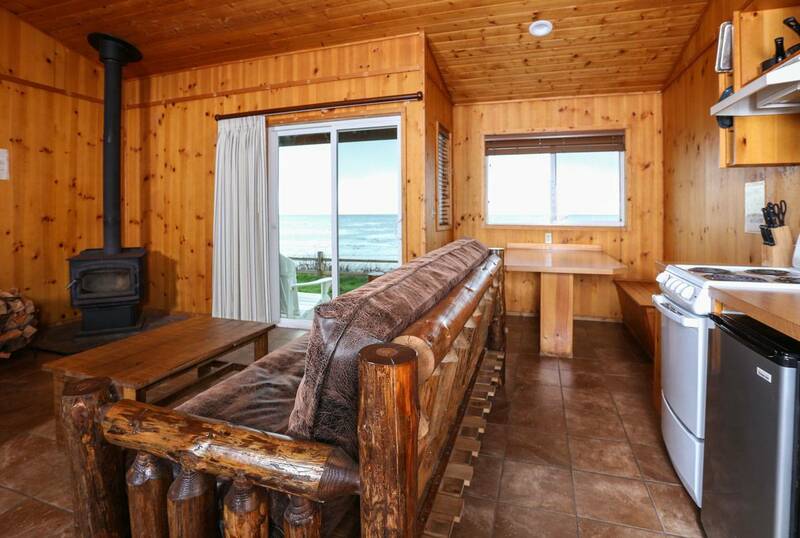 Large windows and exquisite woodwork frame expansive views of the Pacific Ocean, Kalaloch Creek, or towering forests, depending on the cabin's location. Available kitchens and kitchenettes as well as fireplaces and wood-burning stoves add a touch of home. 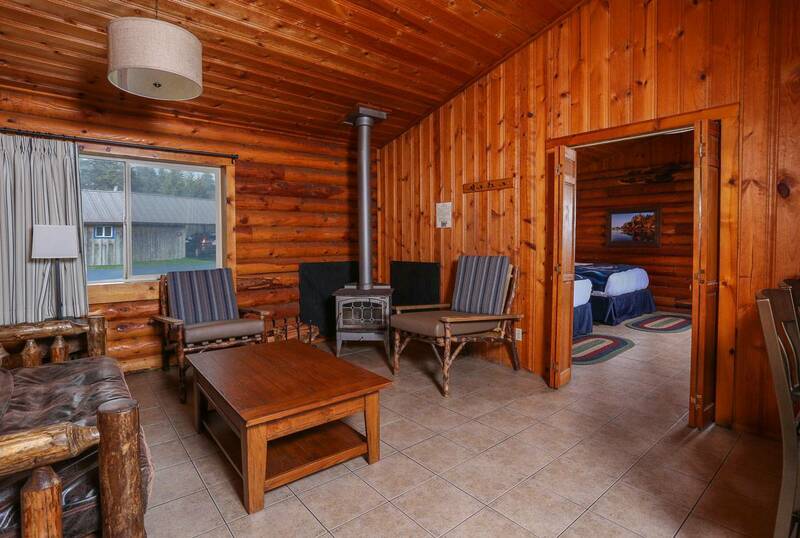 And when we say our cabins come with creature comforts, we truly mean it. All of our cabins are pet-friendly, so your furry friends can join you on your Olympic National Park adventure. 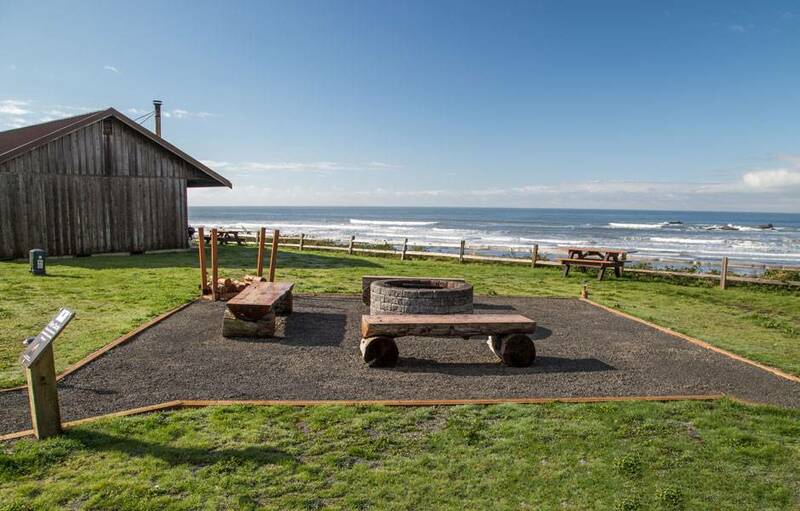 To make the best use of Kalaloch's gorgeous landscape, the cabins are laid out in two rows. 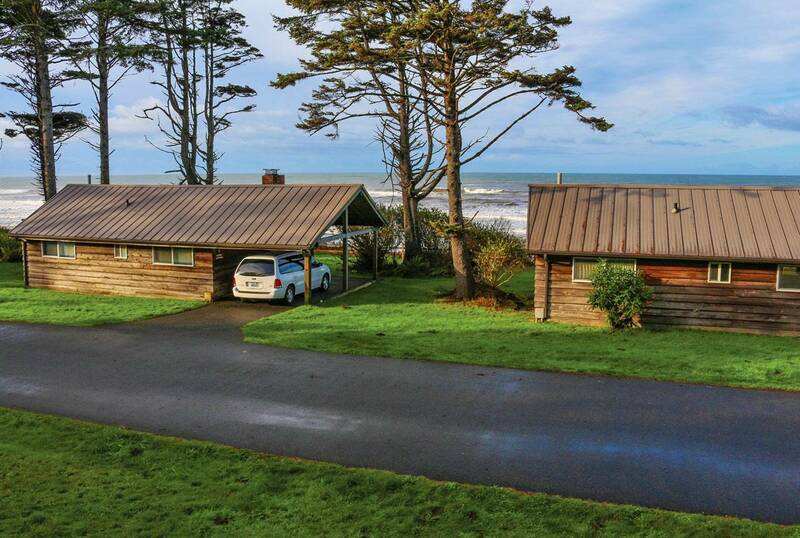 The first row consists of the Bluff Cabins, which, as the name suggests, sit atop the bluff that overlooks the ocean and Kalaloch Creek. 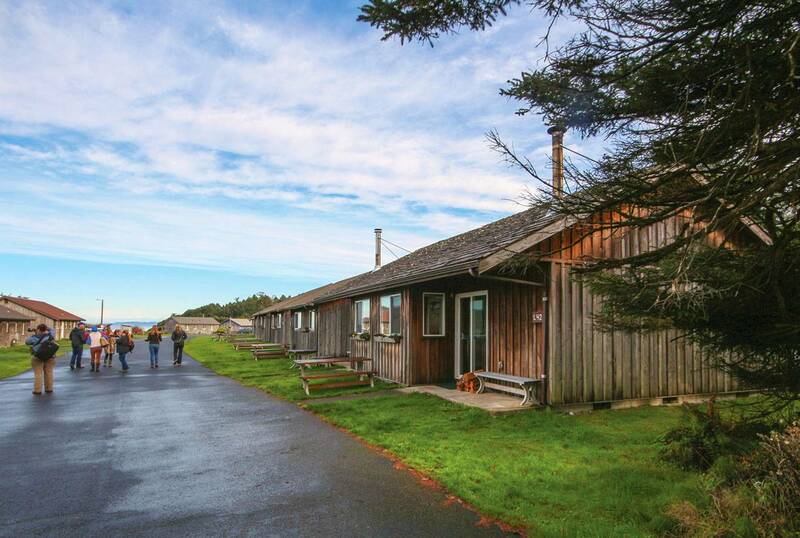 The second row, called Kalaloch Cabins, consists of log cabin-style cottages that fan out behind the Bluff Cabins. 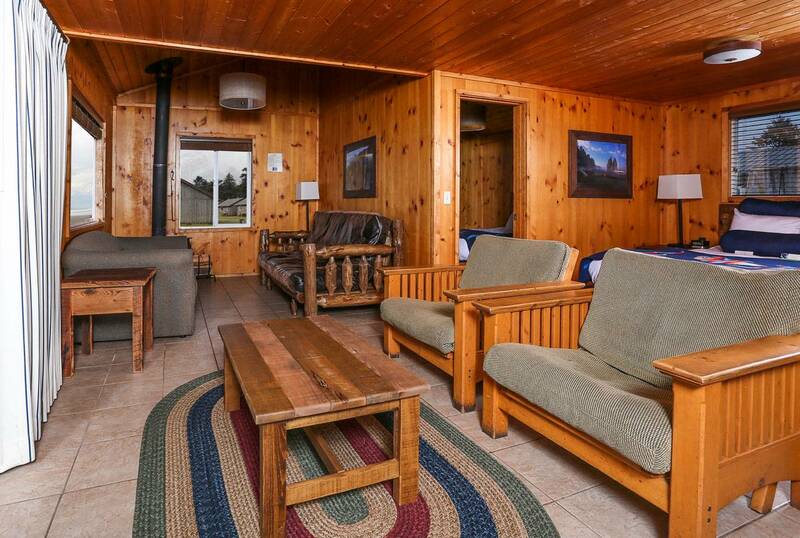 We offer a choice of small, studio-style cabins, and cabins with private bedrooms as well as larger duplex units. 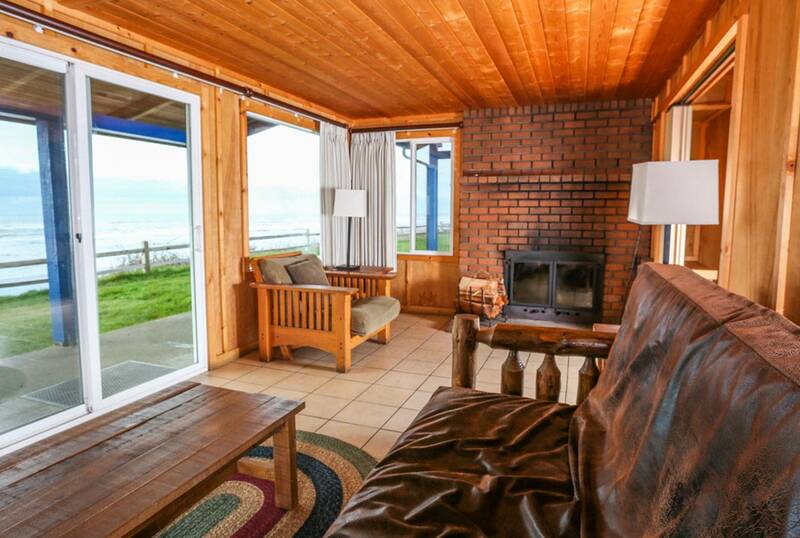 What we don't offer are in-room phones, TVs, and WiFi access, because we want your Kalaloch escape to be a restful and relaxing one. All our cabins are nonsmoking. Love To Cook? We Do Too! If you want to cook in your cabin, you'll just need to bring things like paper towels, baking pans, and baking sheets. 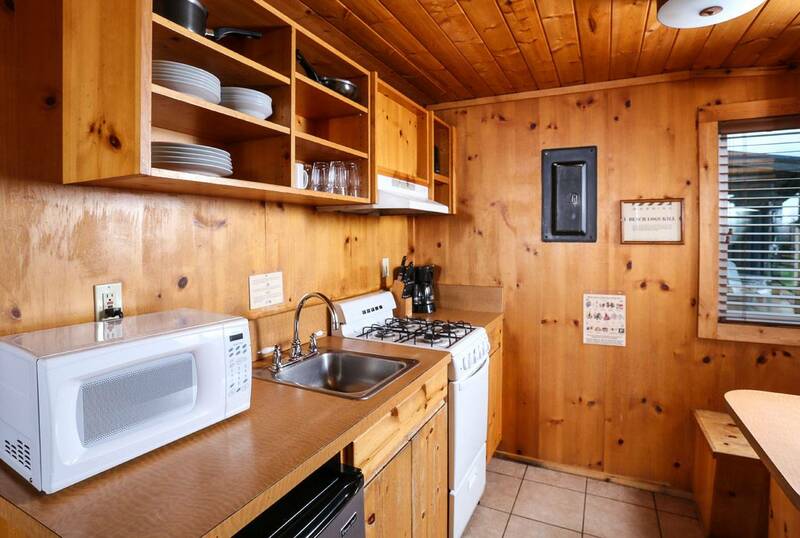 Our cabins with kitchens and kitchenettes already have plates, cups, silverware, utensils, corkscrews, pots, and pans. 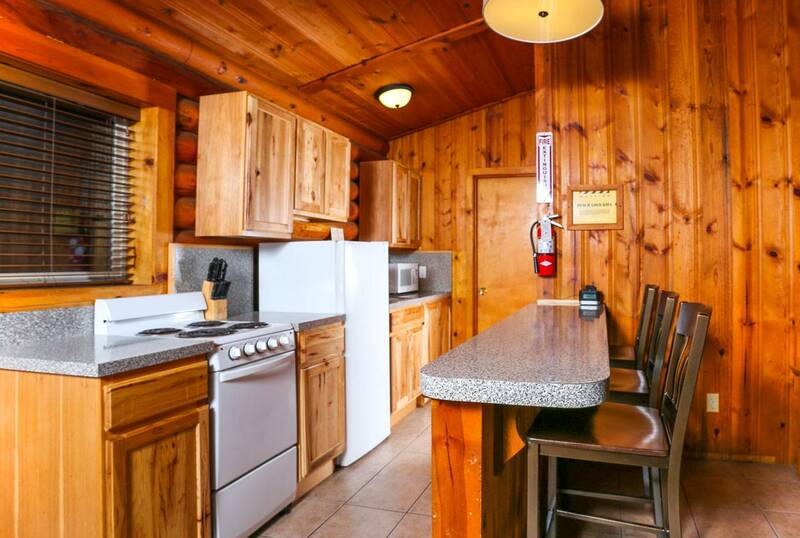 Most of our cabins have full kitchens or kitchenettes. Here's the difference: Full kitchens include a four-burner stove, small oven, refrigerator, microwave, toaster, and coffee maker. 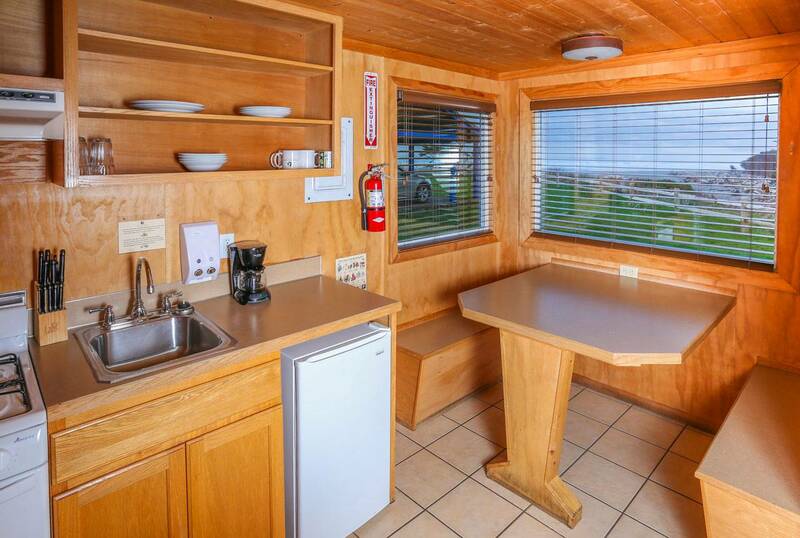 Kitchenettes include a two-burner stove, microwave, toaster, mini-fridge, and coffee maker. Check-in at 4 p.m., Check-out at 11 a.m.
Cabins 1, 2, & 3: Studio style, one queen bed and loveseat futon, full kitchen with breakfast nook, creek/ocean view. Sleeps up to 2 people. Cabins 4 & 5: One private bedroom with one queen bed, studio area with one queen bed and double futon, full kitchen with breakfast nook, creek/ocean view. Sleeps up to 6 people. Cabins 6 & 8: Two private bedrooms; each room with one queen bed, studio with one additional queen bed, double futon with additional seating, wood-burning stove, full kitchen with breakfast nook. Cabin 6 has a creek/ocean view, Cabin 8 has an ocean/beach view. Sleeps up to 8 people. 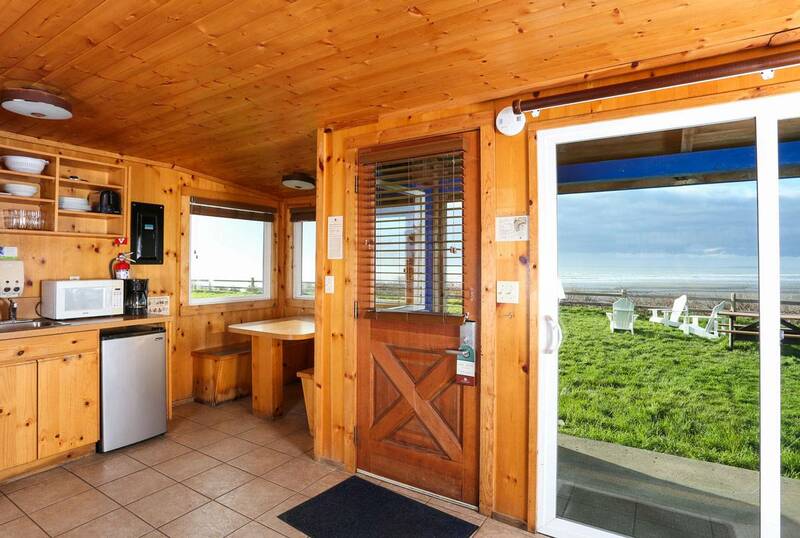 Cabin 7: Studio style, two queen beds with double futon, full kitchen with breakfast nook, ocean/beach view. Sleeps up to 5 people. Cabins 13, 14, Macy, & Overly: Two private bedrooms; one bedroom with one queen bed and the other with one double and one twin, double futon with additional seating, fireplace, full kitchen with breakfast nook, ocean/beach views. Sleeps up to 7 people. Cabins with wood-burning stoves or fireplaces receive one complimentary bundle of wood for each night of your stay. We're happy to note requests for specific cabin numbers, but we can not guarantee an exact location. 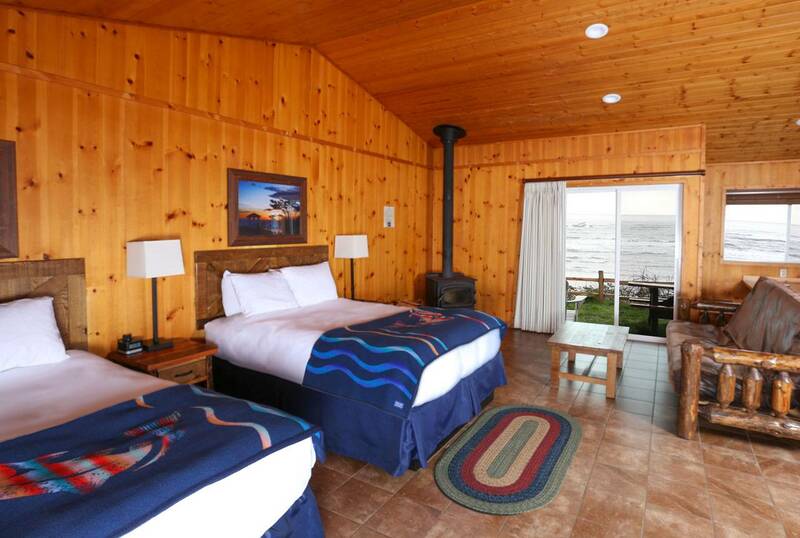 Cabins 9, 10, 11, 12, 15, & 16: Duplex units, studio style, one queen bed, double futon, wood-burning stove, ocean/beach view. Sleeps up to 3 people. Cabins 43 & 44: Duplex unit, studio style, two queen beds, loveseat futon, full kitchen with breakfast nook, wood-burning stove, ocean/beach view. Sleeps up to 6 people. Cabins with wood-burning stoves receive one complimentary bundle of wood for each night of your stay. All duplex-style cabins share a wall with a neighbor. We're happy to note requests for specific cabin numbers, but we can't guarantee an exact location. Note: Cabins 9, 10, 11, 12, 15 & 16 do NOT have cooking facilities. Cabin 43 has accessible features but is not fully ADA accessible. Cabin 44 does NOT have ADA features. 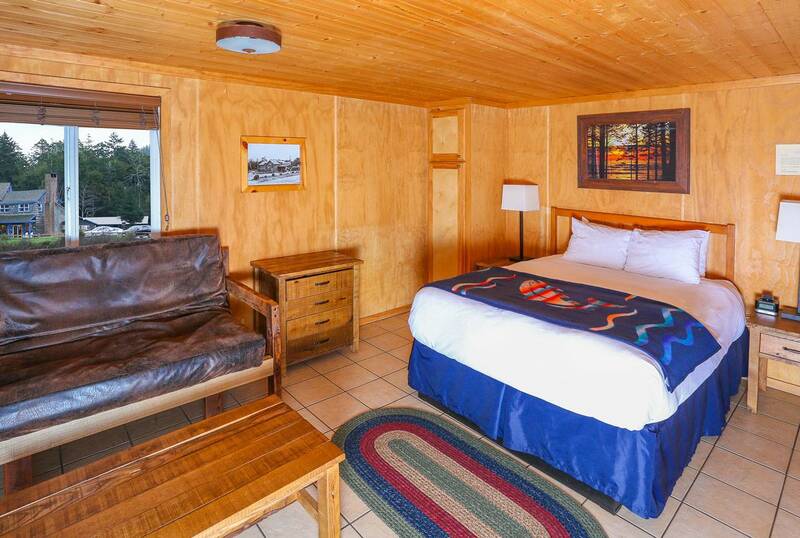 Cabins 19-38: Two queen beds, one privacy wall with open doorway between beds, double futon, kitchenette with table that seats four, wood-burning stove, some have partial views. Sleeps up to 5 people. 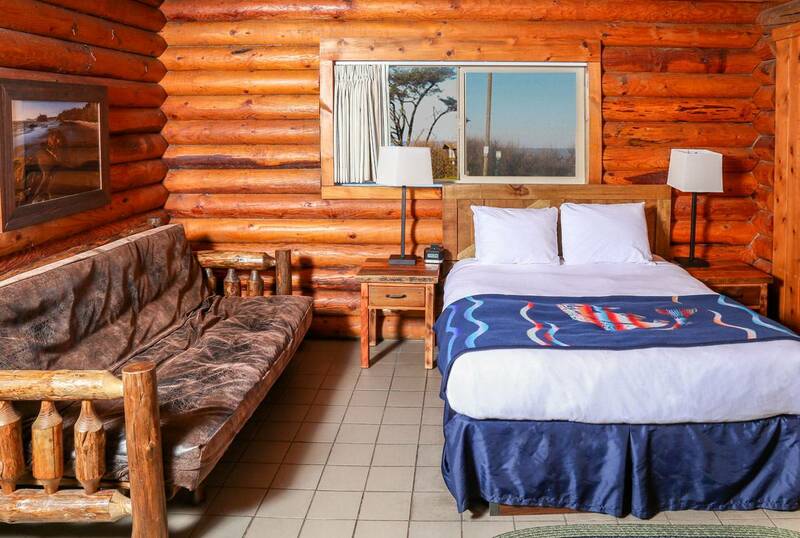 Cabins with wood-burning stoves receive one complimentary bundle of wood for each night of your stay. We're happy to note requests for specific cabin numbers, but we can't guarantee an exact location. 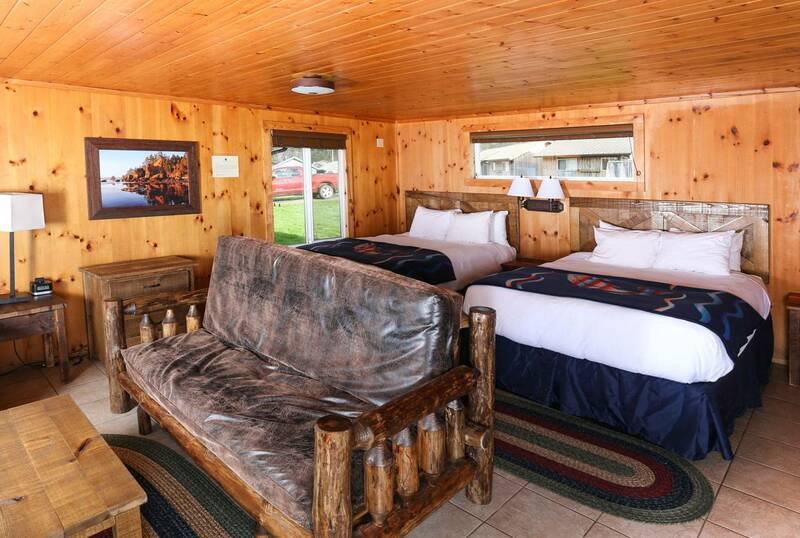 Cabin 39: Duplex unit, connecting door with Cabin 40, two bedrooms, each with one queen bed, loveseat futon, full kitchen, wood-burning stove. Sleeps up to 6 people. 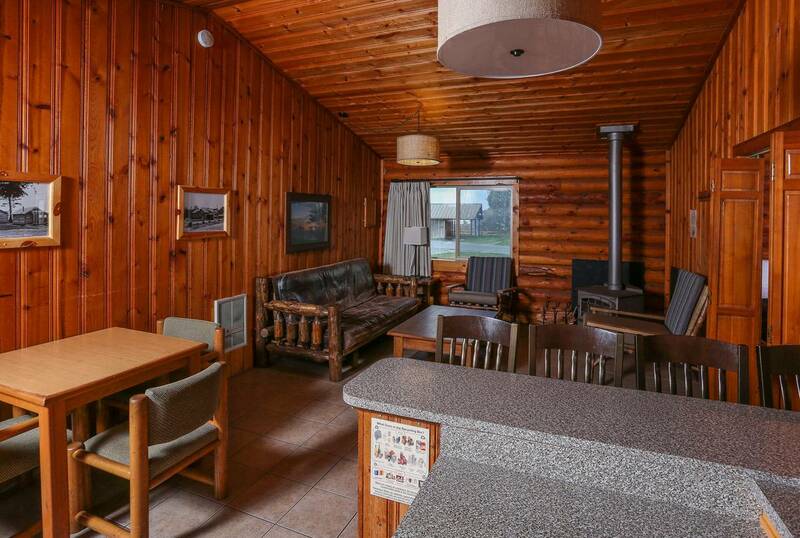 Cabin 40: Duplex unit, connecting door with Cabin 39, one bedroom with two queen beds, loveseat futon, full kitchen, wood-burning stove. Sleeps up to 6 people. 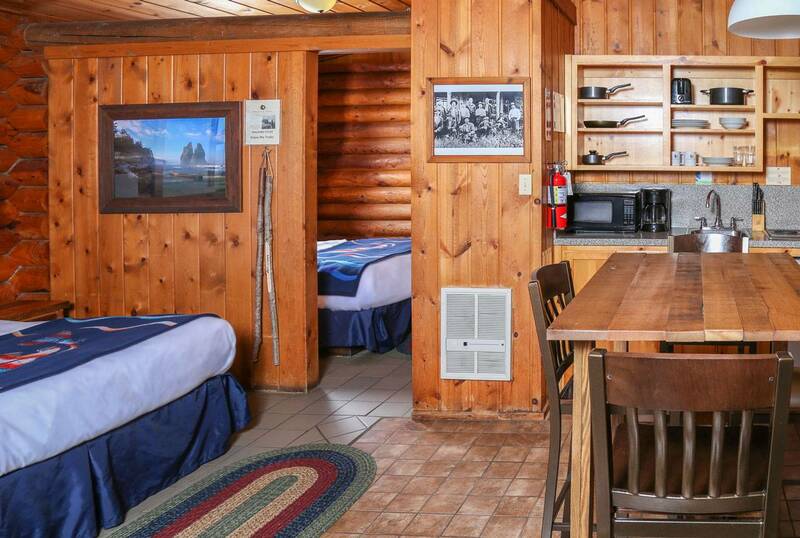 Cabins 41 & 42: Duplex unit, studio style, two queen beds, loveseat futon, full kitchen with breakfast nook, wood-burning stove. Sleeps up to 6 people. Note: Cabin 40 has ADA features but is not fully ADA accessible. Olympic National Park is full of sights, sounds, and experiences you won't want to miss. Explore the area close by, drive to nearby beaches and lakes, or even head out on the water. "Wonderful place to hang your hat. We stayed for three days (two nights) in one of the little cabins. Very cozy and restful. Enjoyed beautiful sunrise, sunset, and everything in between." 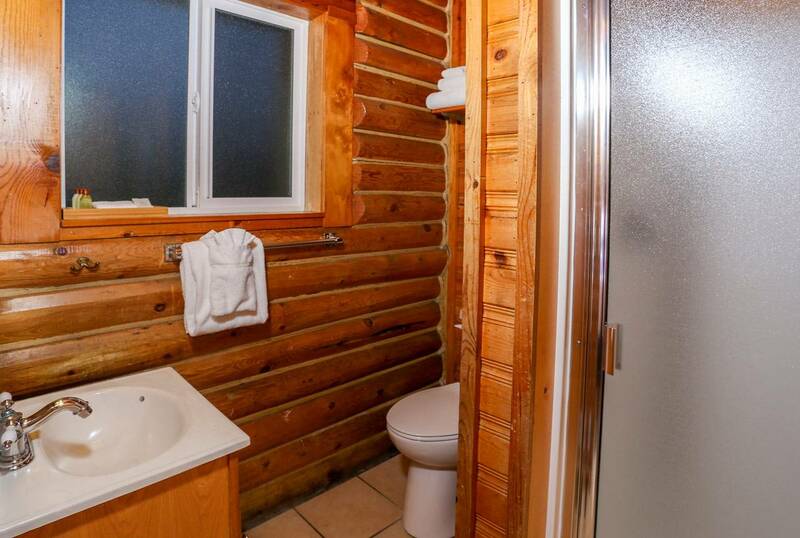 "The cabins don't look great from the outside but are very nice inside. 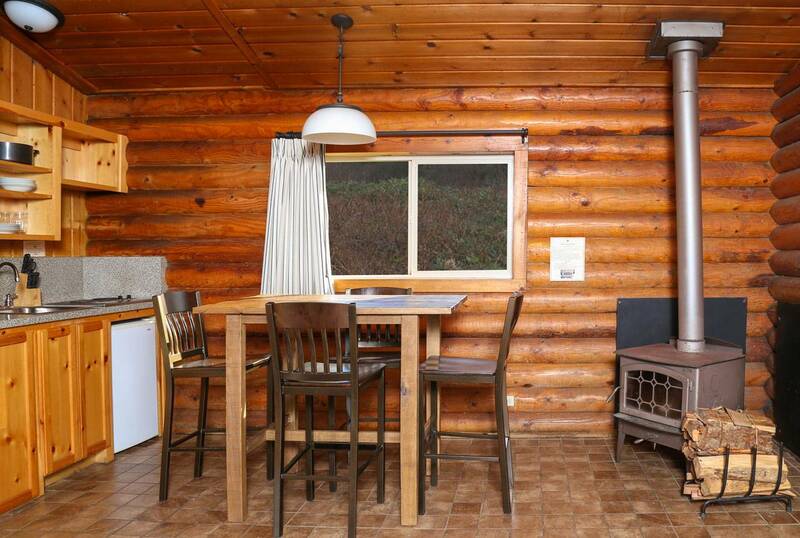 Loved having the wood-burning stove in the cabin, plus all of the necessary kitchen items & kitchenette." "We stayed in the cabins because we wanted a pet friendly place. This was simply great. Best part--the cabin had wood stoves and the park provided firewood!"